As the Bard noted, Summer’s lease hath all too short a date. He didn’t get an option to renew, and now the fickle lover and his bouquets have departed, leaving me with bittersweet memories of our brief affair, promises to return someday, and a last kiss tasting of ripe tomatoes. Autumn has moved in, a genial fellow. But his hands are cold. We had to turn on the furnace this morning. That’s when I finally admitted that Summer Is Not Icumen In. Summer is over. 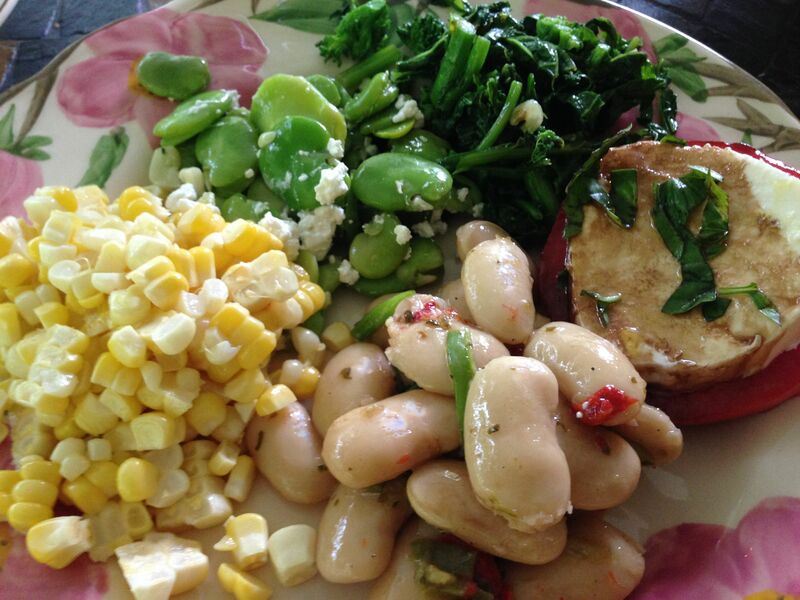 A fond farewell to fresh sweet corn and caprese salads. I refuse to eat grocery store tomatoes! 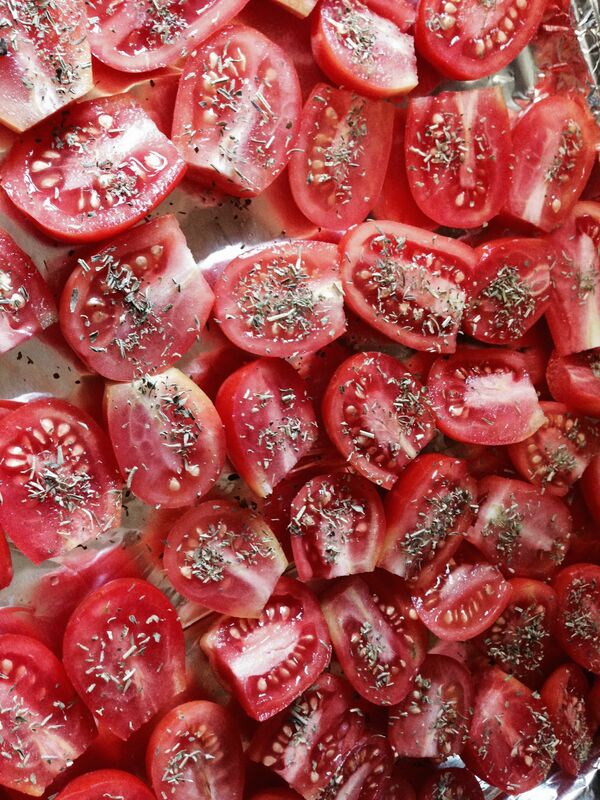 I just finished roasting the last of the plum tomatoes from our garden. We didn’t have as big a harvest this year as last. My procedure is to split them, drizzle with olive oil, sprinkle with herbes de Provence and Maldon salt, then slowly roast for 3 hours at 250 F (120 C). They come out with the flavors concentrated, all ready to be frozen for later use. 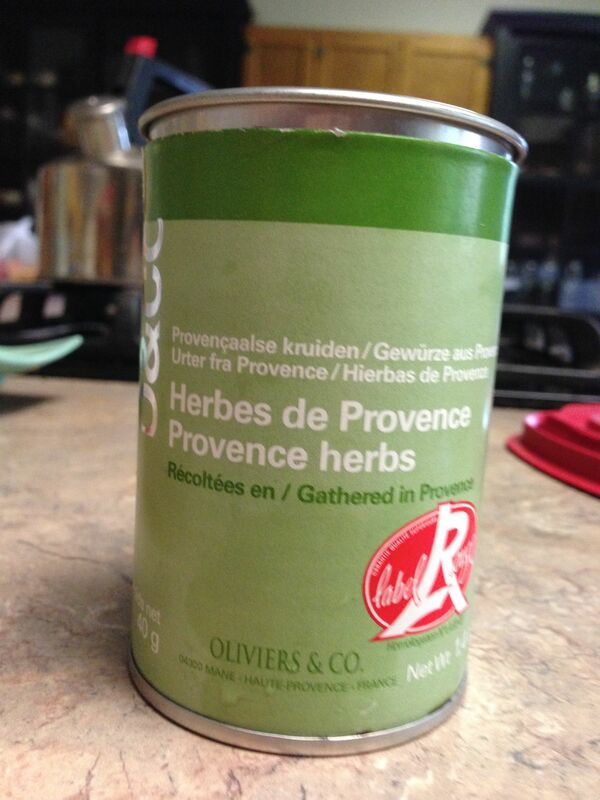 The good stuff: Oliviers & Co.
Line the pans with foil to reduce the mess. Once roasted, these are so good you can eat them as appetizers. 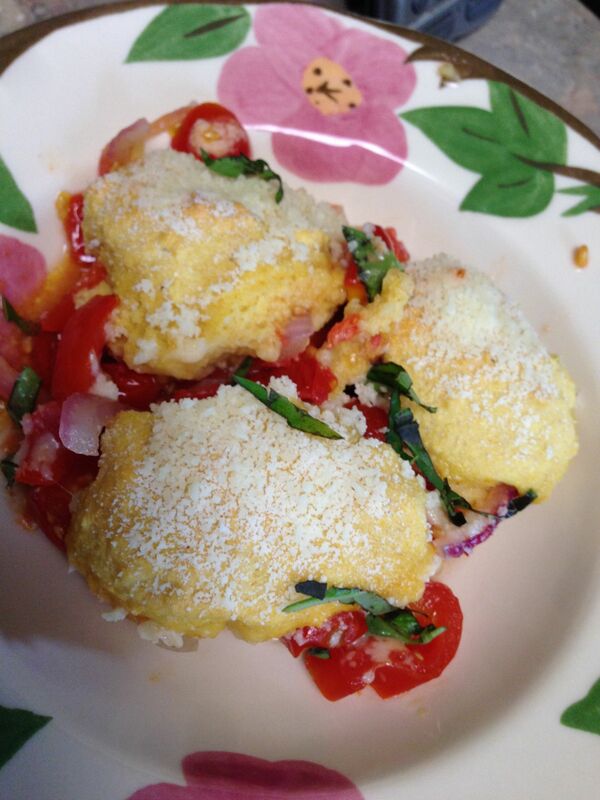 I also made Mark Bittman’s savory tomato cobbler. A clever idea, because after all, tomatoes are fruits. The biscuit topping uses a mix of flour and cornmeal, so it’s very similar to cornbread or a bready polenta. A good match for tomatoes. The version I made was pepped up with red onion, garlic and basil. A good way to use up cherry tomatoes. Summer is the time for cold soups. 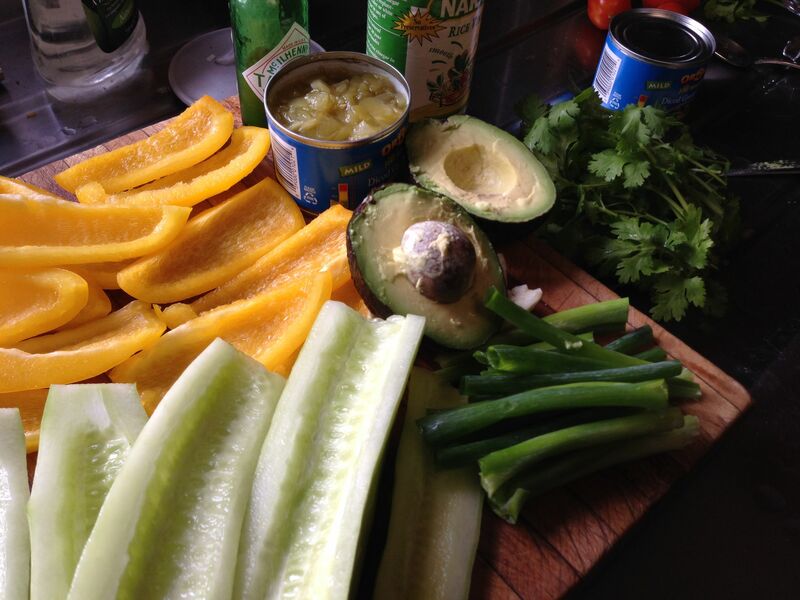 Admittedly I wasn’t able to get these ingredients from my garden, but oh what flavors. Soon I will be craving only hot soups. 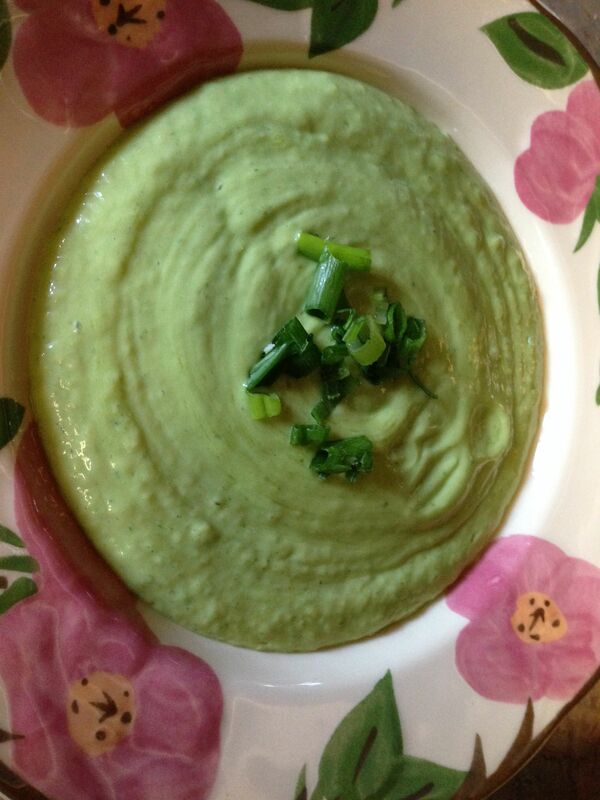 I adapted this from several “chilled avocado soup” recipes online. I call it avocado gazpacho. 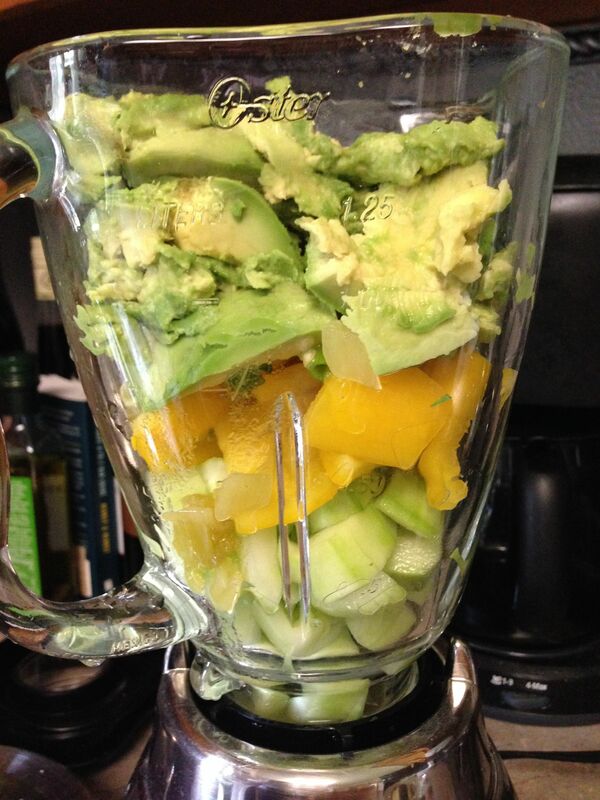 Chop vegetables and put them in the blender. Add the other ingredients and pulse until blended. Chill before serving. If you put the cucumbers on the bottom, and then the bell peppers, the layers slowly descend as each one gets drawn into the maelstrom! If you put the avocado on the bottom, the whole thing tends to get clogged up. This is a thick soup, and incredibly good. The blender makes the avocado fluffy, light and velvety. The great thing about this recipe is that you can adapt it with whatever you’ve got on hand or change the proportions, and it’s still delicious. But if you use red bell peppers, the color might end up grey. I still haven’t recovered from the icy embrace of last winter, and now another one is knocking on the door. But now there will be apples, pears, pumpkins and butternut squash. I’m hoping Autumn’s lease is pleasingly lengthy. Yes, where are those private jets when we need them? I am going to the nursery to get some tomato plants this weekend and a few herbs. I have to, I am not the best gardener. Unless I can eat it, I ain’t interested. And here, we are constantly fending off possums, cockatoos, wallabies, bush turkeys….etc, etc…but tomatoes, I am not too bad at. Especially the cherry tomatoes. I freeze basil pesto when I make it but I have never blanched the leaves first, fab idea! I am rotten at gardening, but luckily I have the LSH who spends untold hours in our high-maintenance yard. The mention of herbs reminds me of our wonderful sage plants this year. I need to harvest some and use them. Yeah to husbands who garden! I have the Yak who does the gardening and defends edible plants from those brush (I mistyped bush!) turkeys. They are a native mound building bird and look like a bit like an American turkey but aren’t closed related. (I did just google oogle the last fact as I have always wondered what the story with them was.) Ohh, sage, love it. Laughing about the bush turkeys. They sound very macho! But you’re in America and you’re eating Cadbury’s chocolate! What…how…huh? I didn’t know it was even available there! Yes, Cadbury has made some inroads, mostly with their cringingly sweet Easter eggs. But you can also get the occasional chocolate bar. I wish we had a bigger selection. 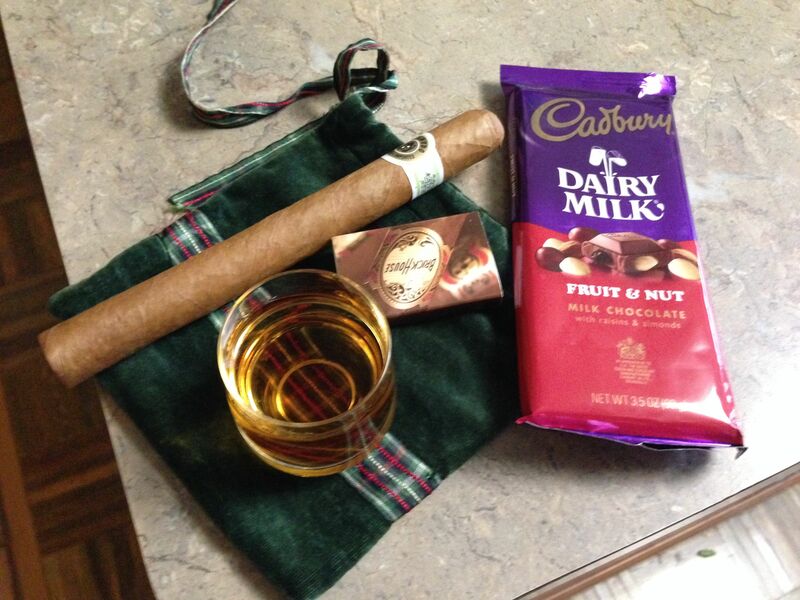 I just got back from my London trip to a vegetable-free house… I shall remedy that in the morning. I want your food!!! Looking forward to more pix from London! Never heard of tomato cobbler, but I’d definitely like to try it. I wish I could avoid grocery store tomatoes, but I can’t grow them here. On my trip to Oklahoma a friend had so many tomatoes in his garden they were just gonna go to waste, so I just stood out there in the sweltering heat stuffing them in my face. Ruined my appetite for dinner, but I didn’t care. There’s no sight worse to me than seeing neglected homegrown tomatoes. He even had those delicious orange ones. Oh lord they were good! Ha! Right off the vine. Delicious! It is most certainly a shame to see good tomatoes go to waste. If I were in your situation, I would just use canned ones. They’re decent, especially in pasta. Yeah, for pasta, I always use the canned ones. I sometimes use a fresh one for a sandwich, but that’s more of a tomato-like tomato.